NGAP has been adopting greyhounds for twenty years and have run our dental clinic for almost as many. Needless to say, we have seen a LOT of greyhound teeth but surprisingly we don't see a lot of cavities! The types of cavities seen in people are hardly ever see in greyhounds. Normally, teeth are long-gone from root exposure and periodontal disease before they get to the point where they have significant cavity issues. 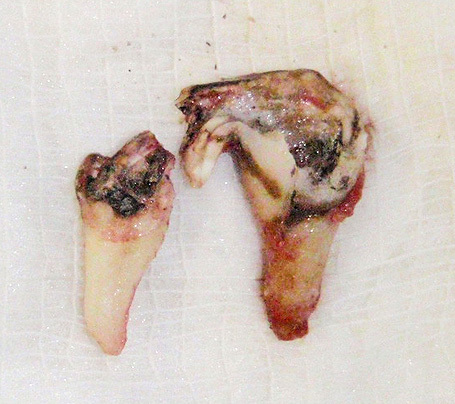 Pictured is a tooth extracted from a dog seen in our clinic clearly showing dental issues. This was plainly visible with the naked eye. If you take the time to pull up your dogs lip on both sides of its mouth every month and look at its molars you should be able to see when problems start to arise. How do you think this dog felt with this tooth?